IGNOU December 2018 Exams Schedule(Time table), Admit Cards / Hall tickets at ignou.ac.in: IGNOU December 2018 exam admit cards released, download hall tickets at ignou.ac.in IGNOU admit cards 2018: IGNOU December 2018 Exams Admit Cards / Hall tickets at ignou.ac.in. Indira Gandhi National Open University (IGNOU) has released the hall tickets for the term end examinations at ignou.ac.in. The varsity will conduct the examination from December 1 and will conclude on December 31, 2018. The last date for submitting the examination form for December 2018 term-end examination is extended till October 31, 2018 (without late fees). Candidates can download the hall tickets by following the steps written below. The Indira Gandhi National Open University (IGNOU) will release the hall tickets for December 2018 examinations soon. 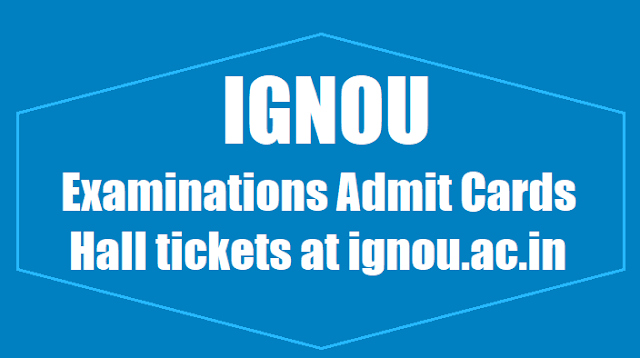 The candidates, who had applied for the examinations can download the admit card through the official website ignou.ac.in. According to the sources, the IGNOU is likely to release the Admit Card from tomorrow i.e., November 22, 2018. The IGNOU exams are scheduled to be conducted from December 1, 2018 and to continue till December 31, 2018. IGNOU admits candidates to its courses twice a year - January and July. Similarly it conducts examination twice - December and May every year. The term-end exams for students of Indira Gandhi National Open University (IGNOU) will be held from December 1 to 31. The students have to download their hall tickets from the IGNOU official website. The hall-tickets for practical exams will be sent separately to the candidates and they need to approach the training centres to collect them. IGNOU December 2018 Exams Schedule and IGNOU December 2018 admit cards download at ignou.ac.in: The admit card will be released at the official website ignou.ac.in. The examination is scheduled to be held from December 1 to 31. The candidates who will appear for the examinations that is scheduled to be conducted from December 1 can download the admit card through the official website ignou.ac.in. The examinations will be concluded on December 31. The candidates are advised to download the hall ticket by entering their name/date of birth and report to the examination centre. In case candidates are unable to download the hall ticket, they can contact the regional centre and obtain the information of examination centre allocated.They need to bring a proof of submission of the entrance test application form along with recent passport size photograph. IGNOU December 2018 Exams and Hall tickets: The Indira Gandhi National Open University (Ignou) will conduct the term end examination (TEE) for December 2018 from December 1 to 31 at over 850 examination centres. The university said it has allotted 855 exam centres, including 16 overseas and 90 venues in jail for jail inmates, for 497,883 eligible students, who applied for the exam. The admit cards or hall tickets have also been issued and are available on the university’s website www.ignou.ac.in, it said in a statement. Officials at exam centres have been instructed to allow students to appear in the exam even if they do not possess the admit card provided their names exist in the list of examinees for that venue, it said. The statement added students must carry the valid identity card issued by the university during the exam and that mobile phones are not permitted inside the exam hall. Separate hall tickets will be issued to the students of bachelor and masters of computer application for term end practicals. Students are advised to contact the respective regional centres in the last week of December for their practical exams. All theory exam centres for students of bachelor in library and information science may not conduct the practical tests. Students must contact the centre superintendent and check the notice board for information about their centre for the practical exam. The Indira Gandhi National Open University (IGNOU) has released the hall tickets for the Term End Examinations (TEE) 2018. Candidates who are appearing for the papers can download their admit cards from the official website of the university (ignou.ac.in). The exams will be commence from December 1 this year and there are 4,97,883 eligible students to whom the hall tickets have been issued. The university has also established 855 exam centres, 16 of which will be overseas and 90 of which will be for jail inmates. The exam centres have been informed to allow students to enter the hall as long as their name is on the list. The lack of hall tickets thereof will not be a hindrance to entry to write the exam. IGNOU, in a press release, also stated that candidates are required to bring an identity card issued by the university on the day of the exam. It noted that mobule phones will not be permitted inside the exam hall. The hall tickets for BCCA and MCA practicals for the term end exams will be issued separately. Steps to download IGNOU TEE December 2018 admit cards: Step 1: Go to the official website of IGNOU as mentioned above. Step 2: Click on the notification that says “Hall Tickets for Dec 2018 Term End Examination”. Step 3: Enter your nine-digit enrollment number and select your course. Step 4: Search for your hall ticket and take a print out of the same for further reference. Candidates must carry the admit card to the examination centre. The term-end exam will commence on December 1 and conclude on December 23, 2018. Click here to check the schedule of the examination. Note: Visit official website of IGNOU for latest news and updates. The candidates are advised to download the hall ticket by entering their name/date of birth and report to the examination centre. In case candidates are unable to download the hall ticket, they can contact the regional centre and obtain the information of examination centre allocated. They need to bring a proof of submission of the entrance test application form along with recent passport size photograph.